Illuminated manuscript on vellum, possibly made for Sir John Talbot (c. 1384-1453) or for someone in his household, France, Rouen, c. 1430. 221 x 155 mm. - 187 leaves, complete. 31 large miniatures, full illuminated borders with burnished gold leaves and colourful plants. This manuscript was possibly made for Sir John Talbot (c. 1384-1453) or someone in his household. He was one of the principal English commanders during the occupation of France, present at the siege of Orléans and taken prisoner from 1429-1433. 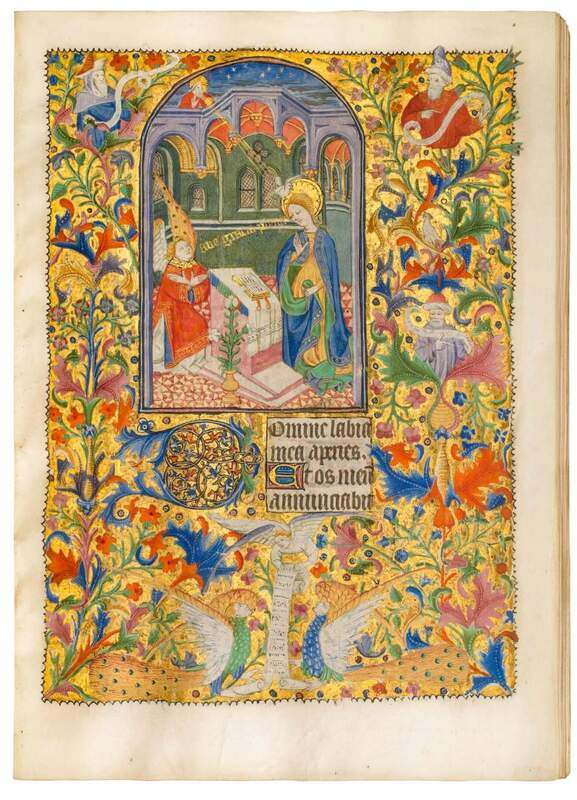 This Book of Hours must have been made during that period. 221 x 155 mm. – 187 leaves, complete. 31 large miniatures, full illuminated borders with burnished gold leaves and colourful plants. The Hours of the Virgin being interspersed with the Hours of the Cross was uncommon in France at the time this book was made but was rather popular in English prayer books, as is the incorporation of Suffrages. In the book at hand, the prayers to Saint Catherine and Saint Margaret are illustrated with large miniatures, which may indicate that these saints are connected with the owner: Sir John Talbot’s oldest daughter was named Katherine, while his second wife’s name was Margaret. The magnificent manuscript was illuminated by three artists in the orbit of the Dunois and Harvard Hannibal Masters. It is, however, evident that all three artists were eager to harmonize their paintings. The palette is quite homogenous and features like skies with minuscule golden stars and silvery streaks of clouds are found in all miniatures.